All Revo performance Software is designed to safely enhance the drive-ability of your vehicle, giving access to more power and torque throughout the rev-range while maintaining the extensive factory safety mechanisms. 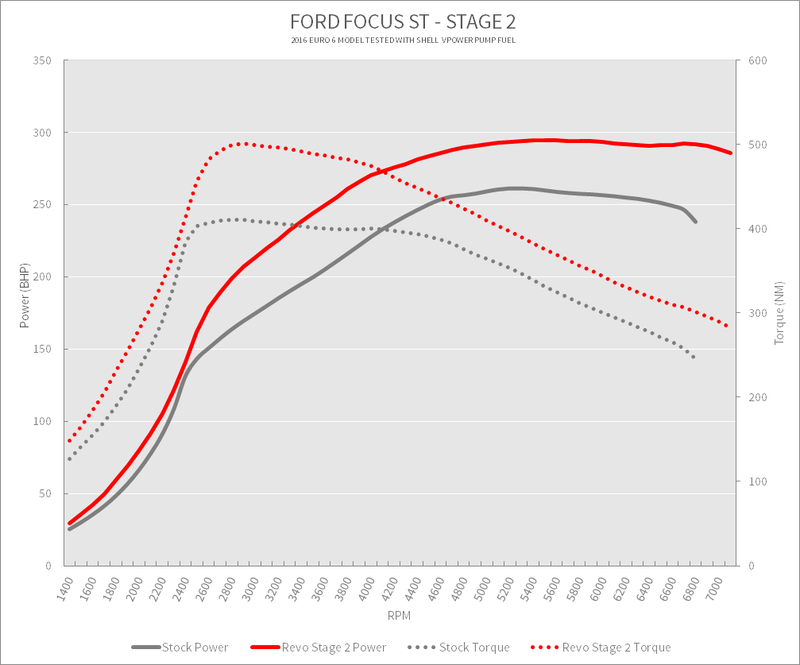 Although Revo offer some of the most substantial performance increases on the market, peak figures form part of a much bigger picture and are never the sole focus during development. Revo Software offers a perfect balance of performance, economy, longevity and safety. 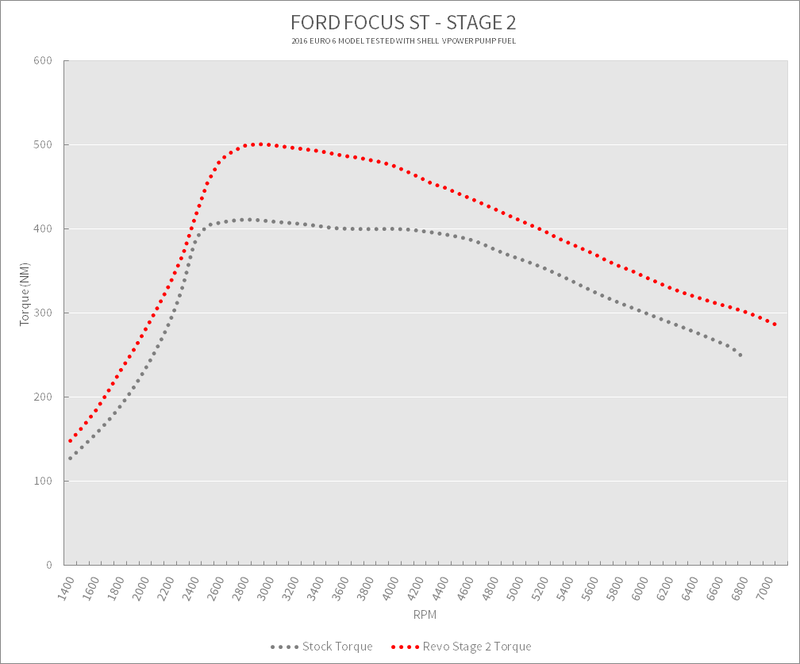 Stage 2 Performance Software has been specifically developed to attain the best possible performance from the ST with a bolt on performance exhaust and Revo Air Intake System. Stage 2 allows you to run a sports cat or de-cat* without the Check Engine Light (CEL) being triggered by a ‘CAT Efficiency’ error code. The Ford sound symposer is disabled allowing you to run an aftermarket exhaust without harmonics issues, and the grill shutters have been deleted allowing you to run a Front Mount Intercooler (FMIC) without any error codes. The Revo SPS Switch gives access to a Stock Mode and can be setup to suit varying qualities of fuel. As per Stage 1 there is also an Anti-Theft mode allowing the user to disable the car for security reasons. 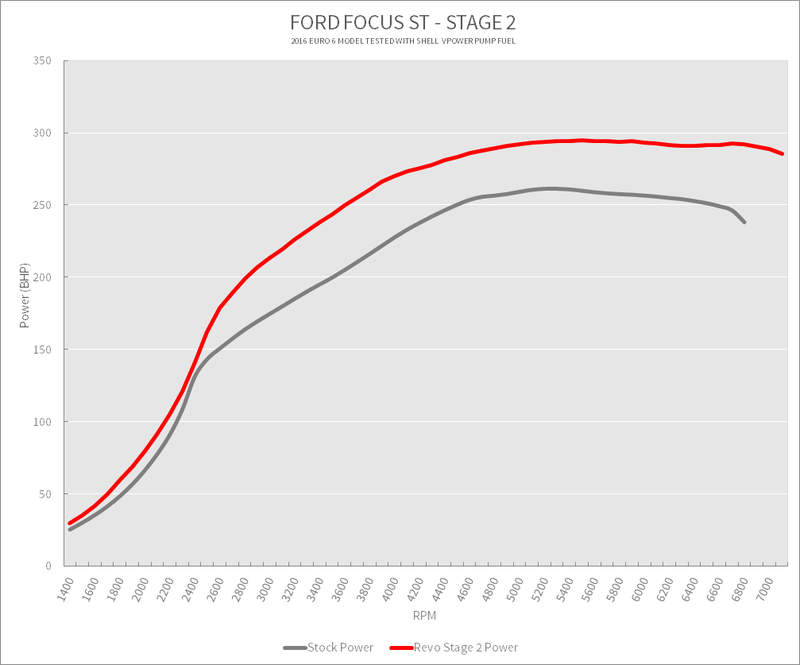 Stage 2 software is designed to suit specific hardware upgrades. Testing facilities at their UK Headquarters and US Development Facility, as well as a track office at Bruntingthorpe Proving Ground and Virginia Point Raceway, Revo are able to test their products extensively on and off track. Testing products in this way is paramount to ensuring that along with more useable power and torque comes refined drive-ability, something often overlooked. Testing on a dyno will only ever tell part of the story. Revo believe in data-logging on the road and racetrack as well as testing in controlled dyno conditions, to give you a clearer picture of the performance you can expect. This plays an important role in the Revo development process, ensuring the highest quality products that perform where and when it matters most. Access to vehicles is imperative to development and testing. Revo run one of the most extensive fleets in the industry, and have access to hundreds of other beta vehicles via a global Authorised Dealer Network. These vehicles not only demonstrates what is capable using Revo products, which cover thousands of miles in a multitude of climates, but also ensures that vehicles perform in any scenario, from a trip to the local shops to an epic adventure in the Alps. *NOTE: Stock mode is not completely stock, it will run similar performance levels to a stock vehicle. Your Revo dealer has a complete factory stock file, if any main dealer warranty or servicing work is required, we recommend returning your vehicle to complete stock. Assisted launch recognises when the car is stationary and engages a 2700 RPM hard limit to help you launch your vehicle. A torque limit in 1st gear will also aid you with traction. The top speed limit for this vehicle has been unlocked. The standard RPM limit has been raised to 7000 RPM to access more power from the engine. Revo Software can be installed quickly and safely via the OBD Port without the need to open the ECU. We know you'll love how Revo Software transforms your car. If you don't, we'll give you your money back. Dependant on your driving style, this software will deliver like for like fuel economy in 'normal' driving conditions.